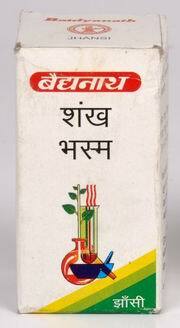 Each 5 gram contains: Sankha suddha 1 Part, Bhavna – Nimbu rasa –q.s. Indicated in dysentery, colic pain, liver and spleen disorder and acidity. 125 mg – 250 mg to be taken twice a day with honey or milk.